Hospital Wayfinding: Rub Some Beacon on It! We’ve always heard laughter is the best medicine, and yet hospitals today are perceived to be depressing and confusing places. They are also difficult to navigate, a labyrinth of shadowy corridors, stairways and mystery doors, with the grim reaper seemingly lurking around every corner. Most hospitals, to their credit, have been going well out of their way to dispel this dreary environment, sometimes at great effort and cost. And clowns, lots of clowns, too. There are many who would say this hurts the hospitals’ cause. Luckily, wayfinding technology is making it easier for providers to solve the maze madness, and to brighten the place up a bit. By incorporating proximity beacons into hospital wayfinding apps, providers can greatly ease the navigation process for patients and visitors. Inject a little humor into these apps and hospitals can bring the best medicine back into their hospitals. And get the clowns out. Sure, the message could have just said “Take next right to the cafeteria” and that would help the hospital wayfinding process, but inserting a joke or two engages your users, and helps them to forget that a hospital is supposed to be morose. Everyone Wants to Laugh. And Not Get Lost. Beacon placed prior to T-Intersection. Beacon at entrance of maternity ward. Beacon at the hospital entrance. We would urge you to come up with better jokes than ours, but the key is to improve hospital wayfinding, while you humanize your organization in the process. Making your patients and visitors feel more comfortable to be there is crucial, and with today’s mandated patient satisfaction surveys, it could have a financial impact as well. With hospital branding becoming more and more essential, organizations should be doing everything in their power to keep their customers healthy AND happy. 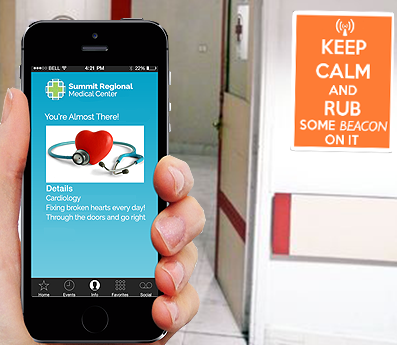 Supplementing signage with hospital wayfinding apps and a little humor is a big step in the right direction. With MobileSmith, providers can take that step, incorporating proximity beacons, maps and general hospital information into a must-have branded app companion for any visitor to your facility, without having to code at all. Further with a dedicated content management system for each of your apps, you can easily manage and update all your notifications, and (thankfully) insert your own jokes and humor, if you so choose. 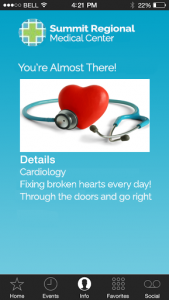 Ease of wayfinding aside, these apps will enable you to boost your brand, while engaging your patients and visitors on a humorous and personal level. Without clowns. Pointsmap has been providing this kind of hospital way finding for two years, including step-by-step directions and colored map paths on your smartphone. We are looking for more hospitals to provide this service to patients and visitors. Mobile wayfinding is an exciting new trend, indeed. Further, with all the innovation, especially with proximity beacons, it’s helping hospitals find a cheaper and more efficient way to enhance navigation and engagement with patients and visitors. Thanks for reading and commenting, Dan.